The Lost City of the Monkey God is the story of the recent discovery of ancient ruins in Honduras. It's a book about archaeology and adventure, but also a book about the past and the future. 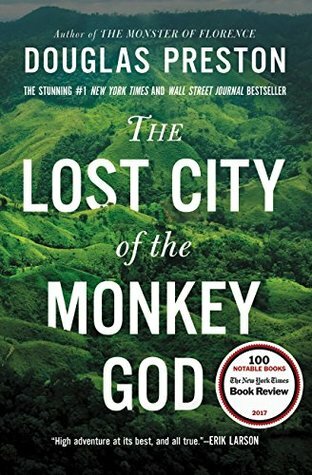 The story starts when Douglas Preston attaches himself to a wealthy hobbyist who hopes to find a mythical lost city - Ciudad Blanca, also sometimes known as The City of the Monkey God. That city was mentioned in the chronicles of early conquistadors, and its myth had grown over time. Early in the 20th century, another hobbyist funded several attempts to discover it, including one which claimed to have resulted in success, but which kept the coordinates secret. Reportage about those attempts would inspire other wannabe adventurers for nearly a hundred years. The attempts and efforts which resulted in this book were different from previous ones: they used lidar technology to scan four sections of the jungle where the city was suspected of being, based on research of the records left behind by other people who claimed to have found it. When lidar revealed patterns that suggested human construction, in the deepest jungle, expeditions went out to find the ruins on the ground. There are some aspects of the story of the discovery that might be a little troubling. The "dancing with the devil" that the organisers decided to do (hiring a criminal with good connections to support their efforts in Honduras in the early stages) makes for uncomfortable reading. Then, once the expeditions become more serious and involve reputable scientists, the criticisms flung against their work by a charlatan who uses the language of social justice campaigners as a weapon are utterly depressing. Especially since said charlatan is a disreputable self-promoter, guilty of everything he accuses the expedition of: it's a sad example of the way social justice theories have become weaponised, used not to bring about improvements, but as a tool to attack individuals, heavily used by con artists and trolls to fire up angry insta-mobs. I was a little worried that the book would be either boring, or over-sensationalised. Fortunately, it was neither. Douglas Preston managed to breathe excitement into a non-fiction account where the reader would know the outcome before picking up the book. He brought the landscapes and the people vividly to life, while taking care to write factually and objectively about everything that was found, and everything that happened before and after the discovery. More importantly, when later chapter deal with diseases, he quickly and efficiently summarises things in ways that were eye-opening to the point of feeling like new information to me. It's a highly readable, interesting book - and even educational!